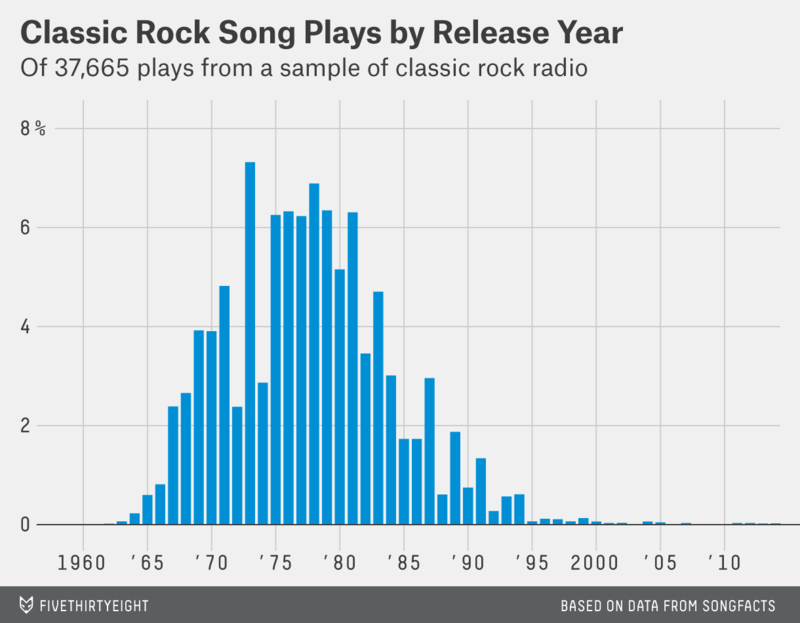 Led Zeppelin (left) and Green Day (right) both get played on classic rock radio stations, even though the bands made music in different decades. In order of size of metropolitan area: WAXQ, New York; KLOS, Los Angeles; WLUP, Chicago; KZPS, Dallas; KGLK, Houston; WMGK, Philadelphia; WBIG, Washington; WBGG, Miami; WZLX, Boston; KUFX, San Francisco; KSLX, Phoenix; WCSX, Detroit; KZOK, Seattle; KGB, San Diego; WXGL, Tampa; KSHE, St. Louis; KRFX, Denver; WDVE, Pittsburgh; WRFX, Charlotte; KGON, Portland; KZEP, San Antonio; KSEG, Sacramento; WOFX, Cincinnati; WNCX, Cleveland; KCFX, Kansas City. 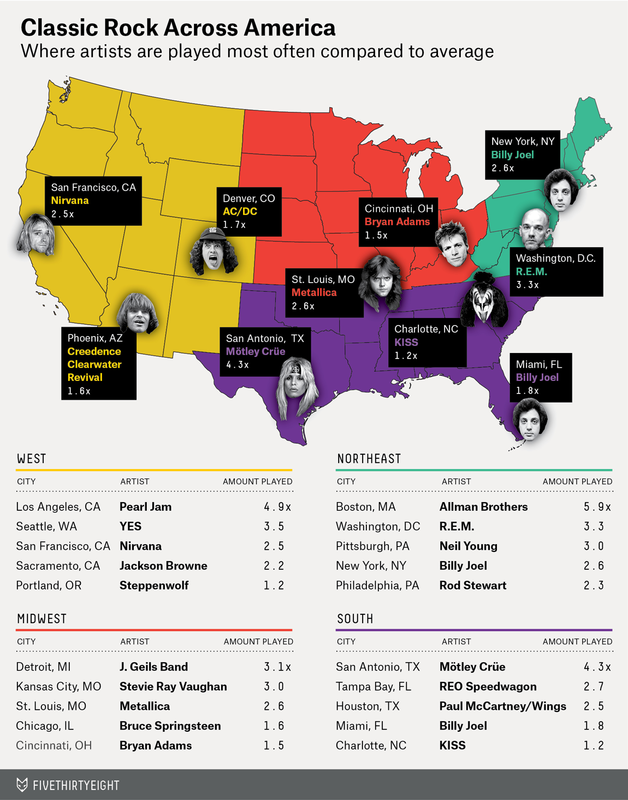 I located the classic rock station in each of the 30 largest metropolitan statistical areas as determined by the U.S. Office of Management and Budget. I was able to locate a devoted classic rock station in all of them except Riverside, California, and Orlando, Florida. 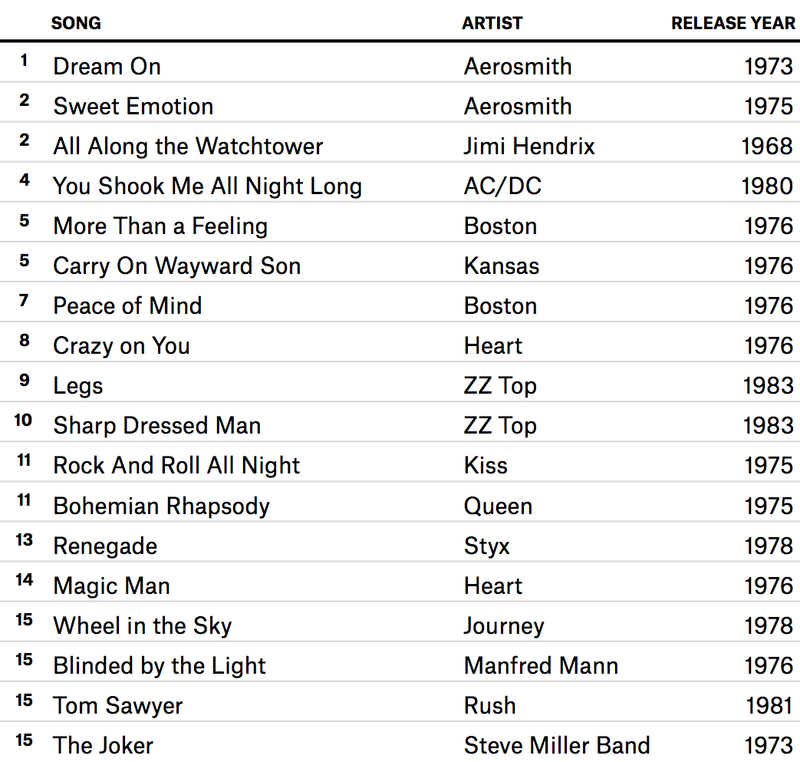 Of the remaining 28 classic rock stations, I monitored what they played from 12:01 a.m. Monday, June 16, to 11:59 p.m., Sunday, June 22 — a solid week of content. The scrape crashed the afternoon of June 17, but was up and running again that evening. The data I attempted to scrape from WSRV in Atlanta, KQRS in Minneapolis and WZBA in Baltimore proved to be unusable due to coding errors on my part, leaving us with 25 effectively scraped stations. You can find the code I used on GitHub. Essentially, if you randomly pull a song from that set, there’s a 9 in 10 chance I know what year it came out. I decided to rely exclusively on the SongFacts database for this project, but the depth of coverage could stand to benefit from diversified sources. That’s a project for a later date, and if anyone is interested, the song release year data can be found on GitHub. The first song in the set is “Rock Around The Clock” by Bill Haley, released in 1955, followed by “Johnny B. Goode” by Chuck Berry, released in 1958. Those are the only songs in the set released in the 1950s. 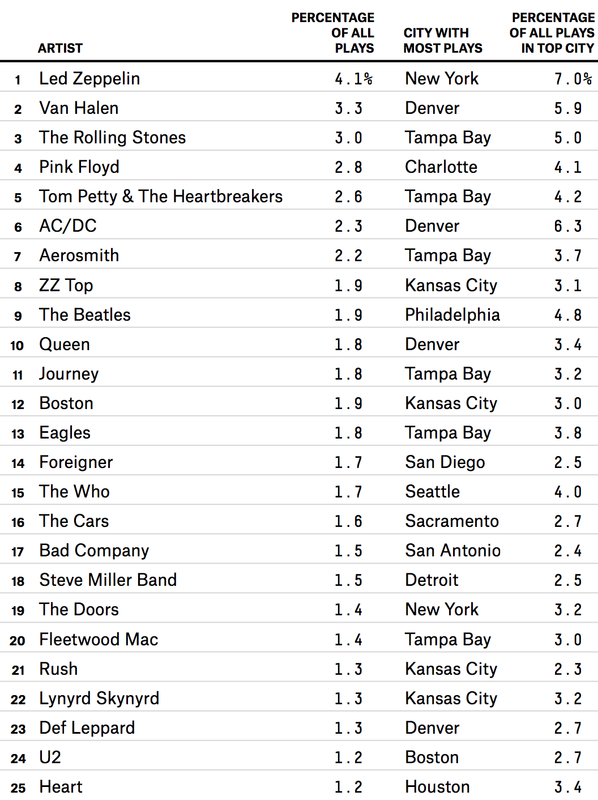 Bruce Springsteen and Paul McCartney also dropped hit albums that year. Don’t worry, there are some exceptions. For instance, DJs often have latitude to choose which of the 12 songs per hour get dropped, and if your favorite DJ has a daily special, she probably has more discretion.